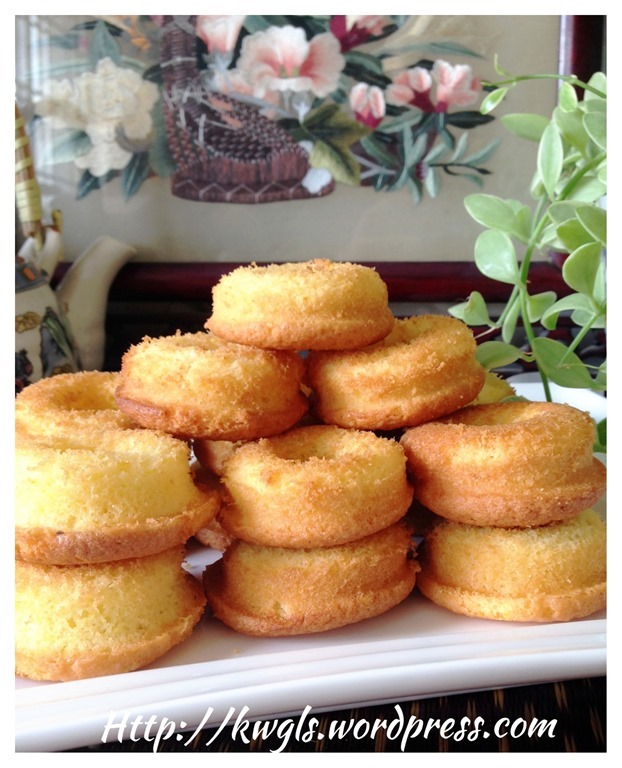 I have prepared some simple butter cakes for kid’s Malaysian cousin to munch when they are shopping in Singapore. 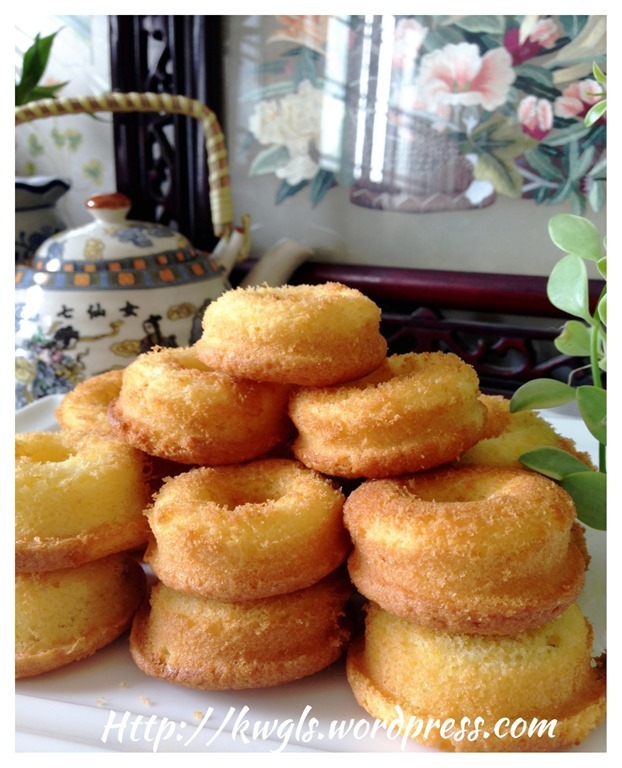 As kids don’t really like butter cake, therefore, I have used the mini-donut moulds to bake the butter cake. 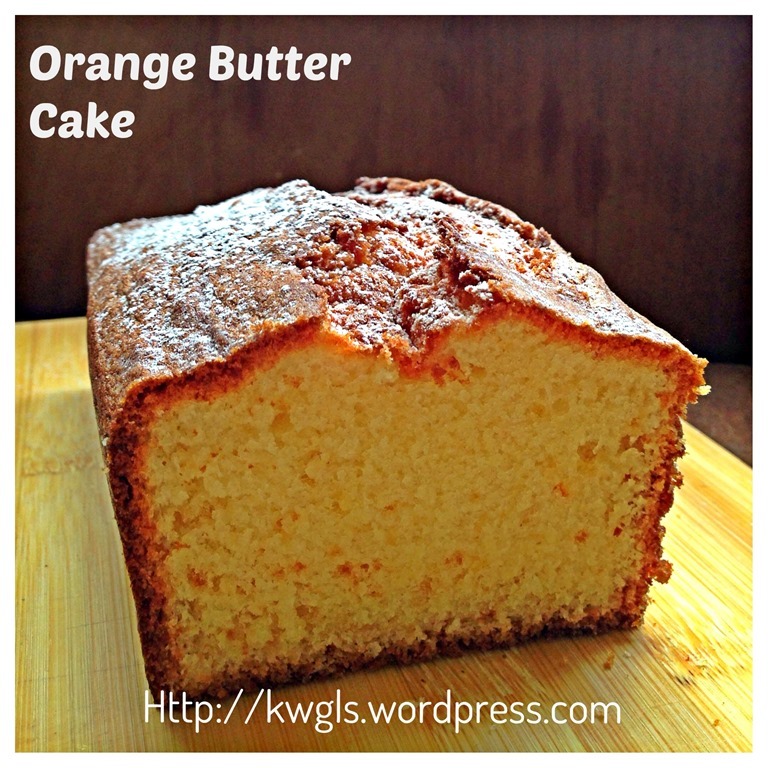 I baked only 2 eggs and it yielded about 20 small crispy orange butter cake. Recipe have been adjusted for only using 2 eggs and are indicated in red. 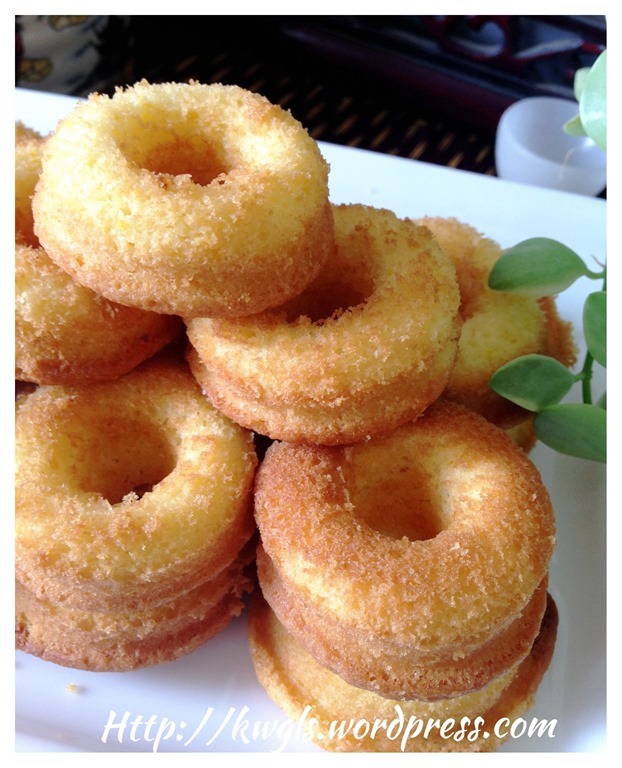 If preferred, kuih bahulu mould can also be used. 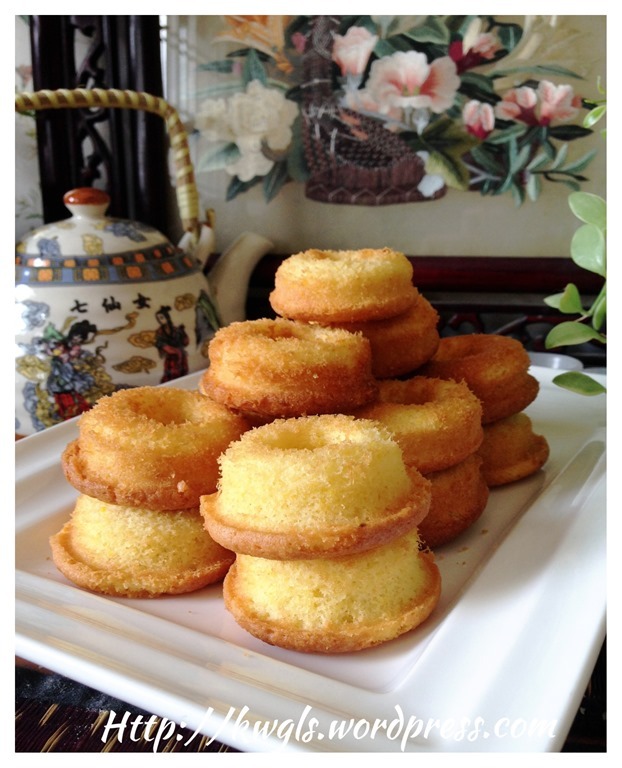 It is not the first time I used small moulds to bake butter cake, be it baking in kuih bahulu mould or mini donut mould. due to its small volume of batter, it took about 10-15 minutes to get bake and have a tendency to get crispy exterior. The texture is exactly like kuih bahulu texture. Readers who want to play some trick and serve your little one, you can try this method. I did not take any pictures for this but just sharing some of the photo. 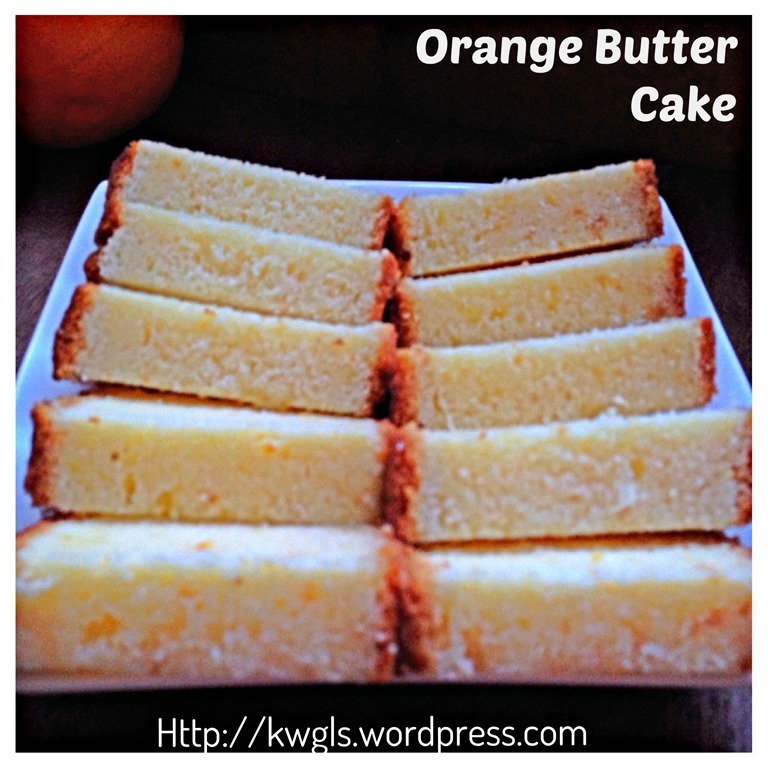 I am preparing this simple orange cake for my mother in law to bring back to her home town. 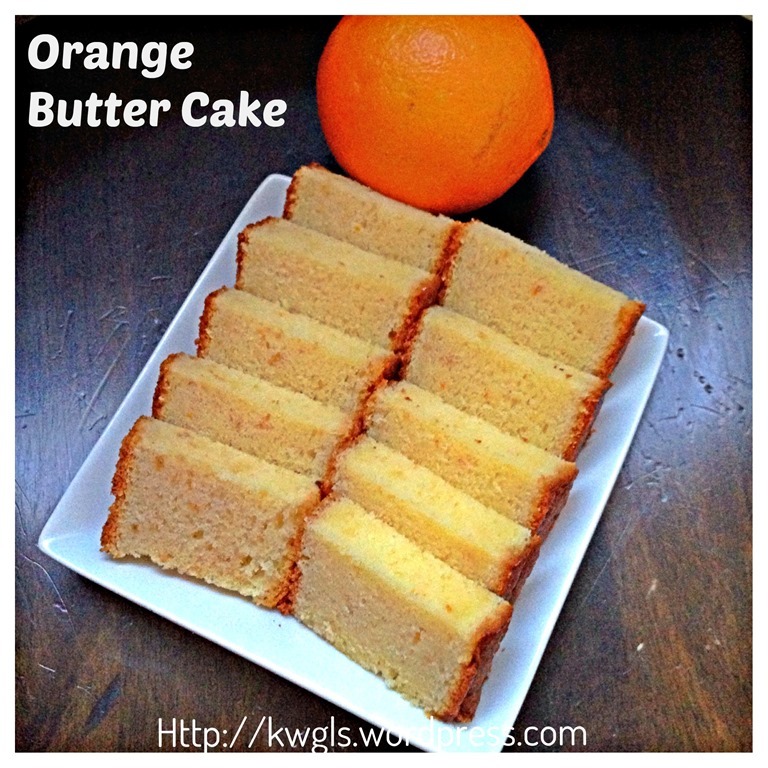 This is a modified yet classic type of orange cake without much to right about. 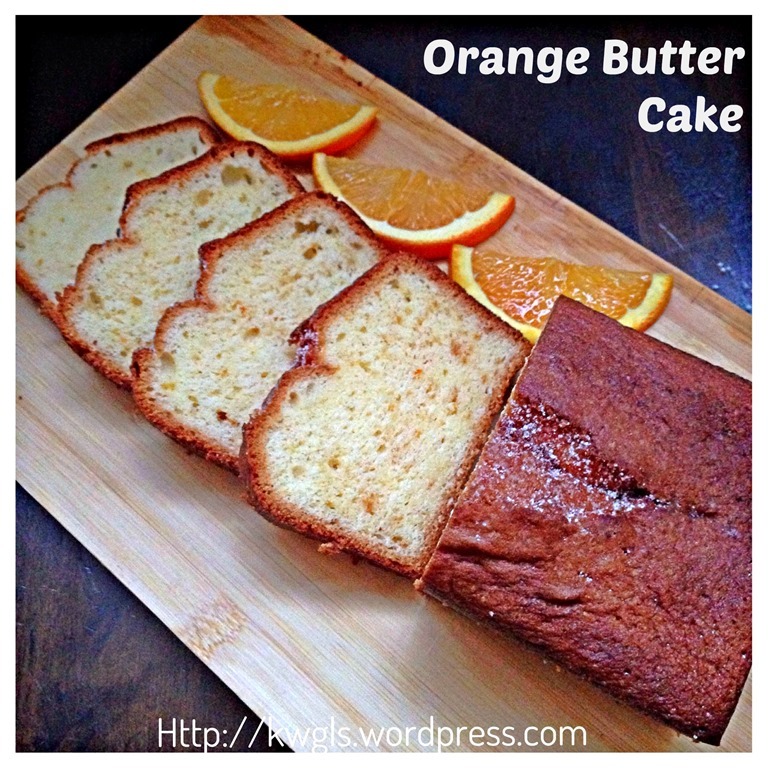 Orange cakes are basically cakes with orange zest and orange juices. and I can’t go far different from this either. 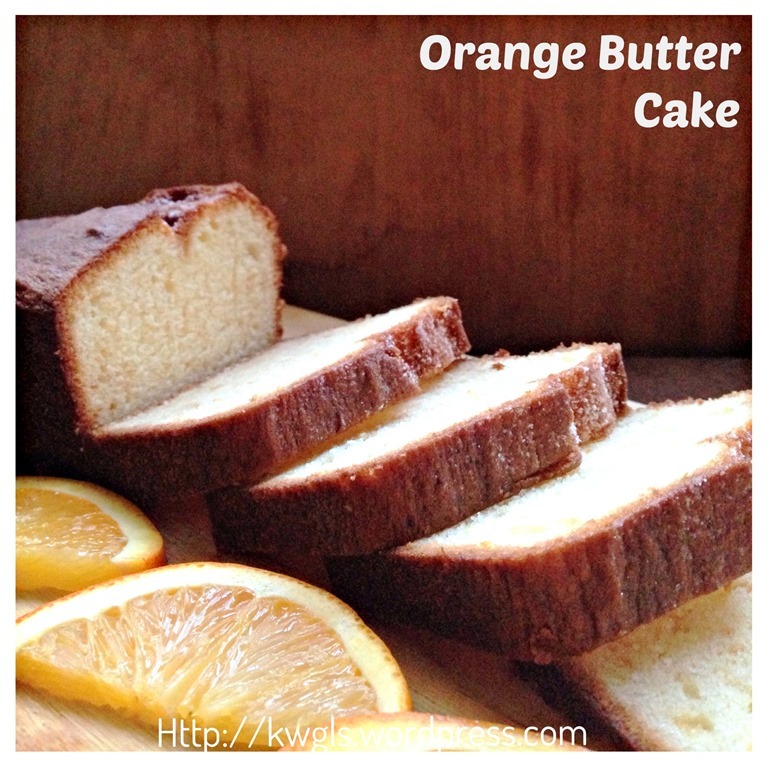 There is nothing much to shout about and this is prepared based on my modified pound cake recipe. The cake is definitely moist, no doubt about it.. 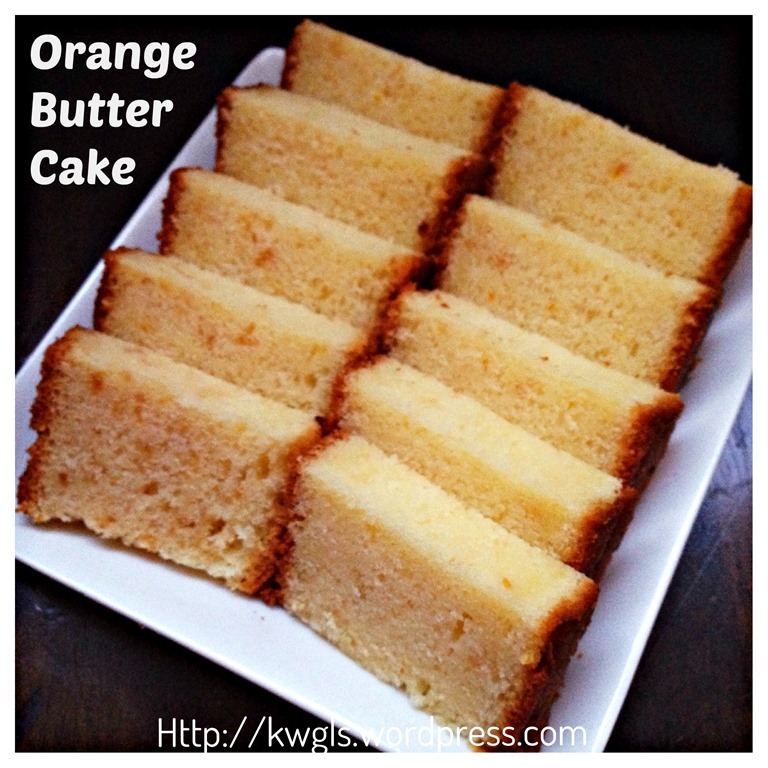 Egg separation method have made the cake fluffier and finer. 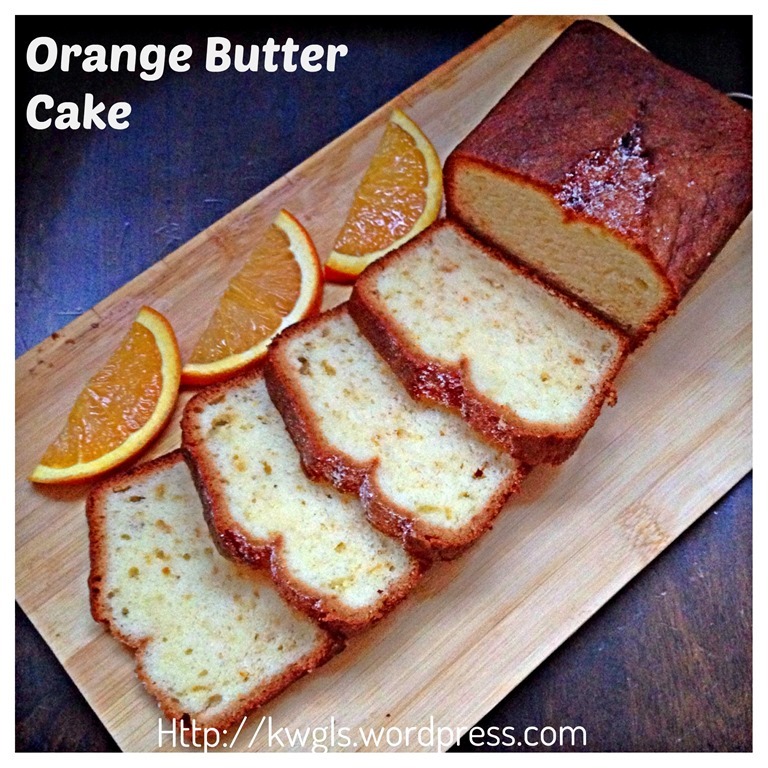 The orange zest quantities that were stated here were just nice for my taste bud, but if you prefer a stronger flavour, you can use 1-2 tablespoon more. If you have orange liquor, you can substitute part of the orange juice with the orange liquor. And if you have orange essence, you can used it too. The quantities stated in this illustration was adequate to prepare an 8” square tin an a cake loaf, you can always reduce accordingly or if you have extra, you can transfer to the cupcakes cups and bake it. For an 8’ square tin of cake, the butter used shall be 250 gram instead of 400 gram used, egg used shall be 5 eggs instead of 8 eggs as stated below. 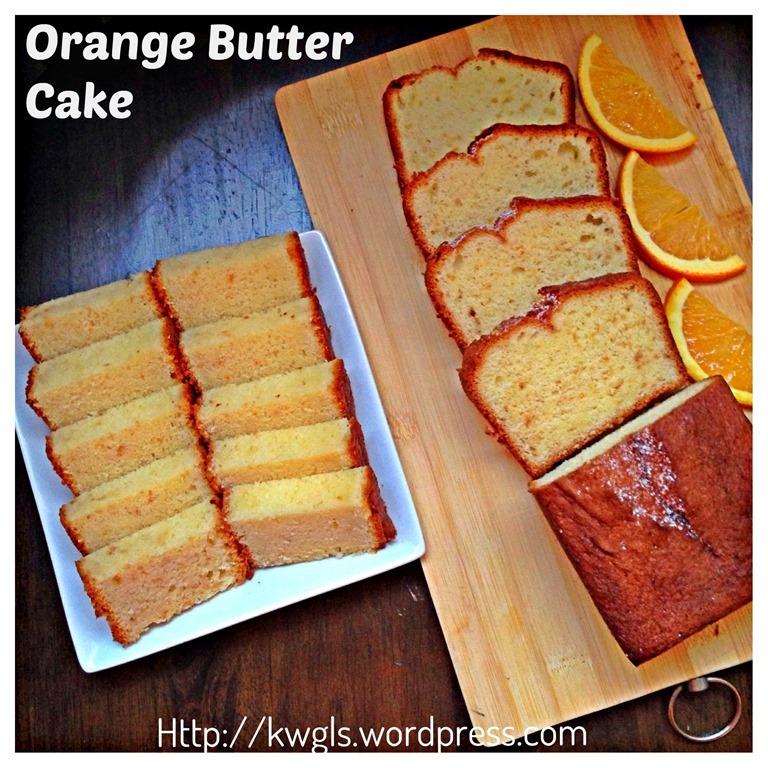 Note that the recipe is also a good cupcake recipe and you can easily bake in cupcake and top with orange frosting or your desired types of frosting. ** Measurement in red is for a 2 eggs recipe which fits into a 6 inches square baking tin or normal loaf tin or yields about 20 small mini donut sized cake or 40 bahulu sized small cake. Lightly grease the desired baking tins or lined with parchment paper. 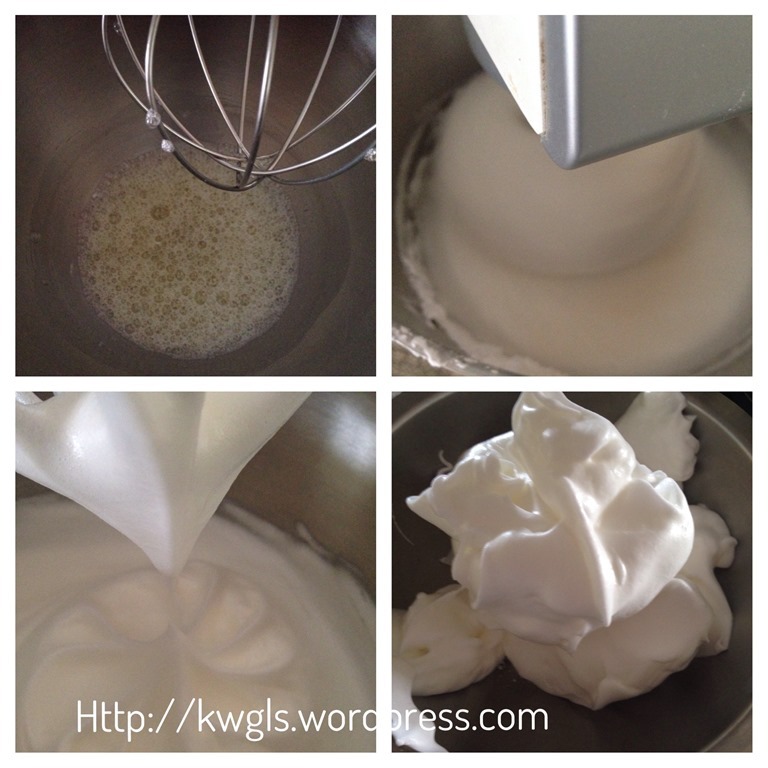 In a big mixing bowl, place your egg whites and beat using the machine whisk to whisk the egg whites until foamy (about 1 minutes). 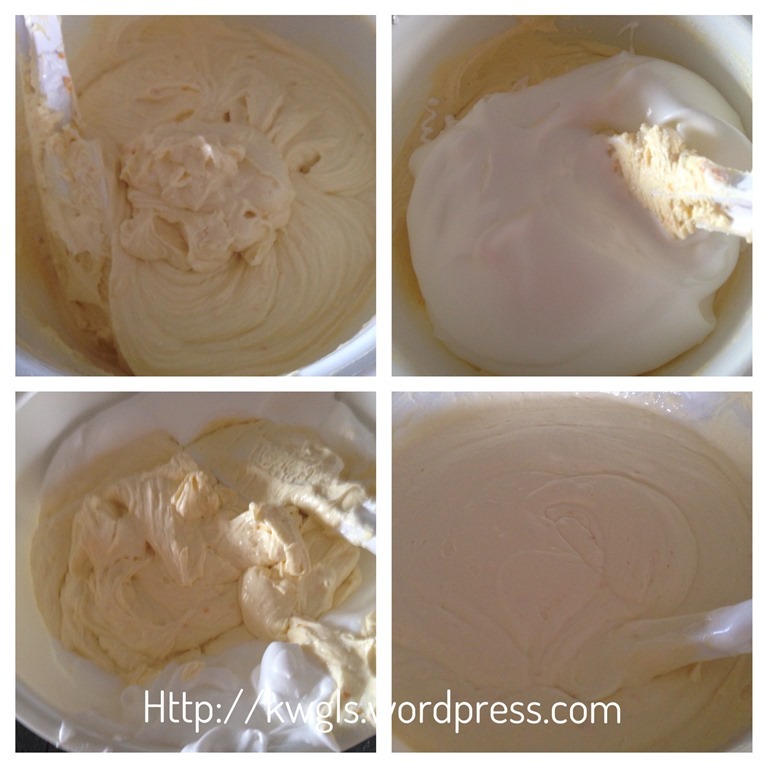 Gradually add the cream of tartar and beat until soft peak (about 1-2 minutes). When the volume expands, add in the sugar (200g) gradually, beat until thick and glossy and until all the sugars dissolved. Spoon the filling into a clean bowl and set aside for later use. Please ensure that before whisking, the whisking bowl have to be extremely clean, dry and free of any oils and egg whites shall not be stained with egg whites. 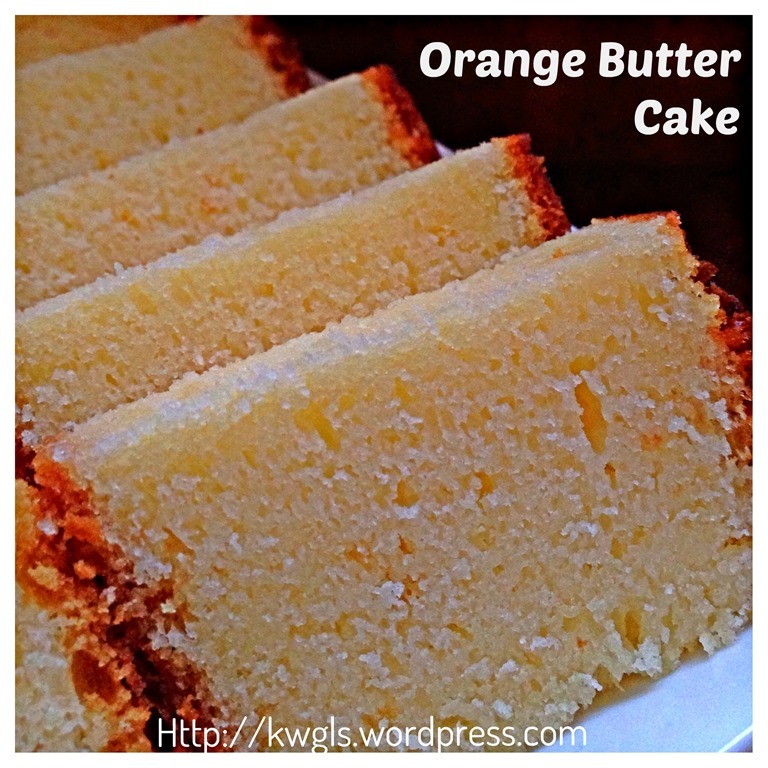 Place your remaining 200 g sugar,ghee and butter in another whisking bowl, beat until light and creamy. Add in the eggs yolks and use slow speed to “mix” until well mixed. 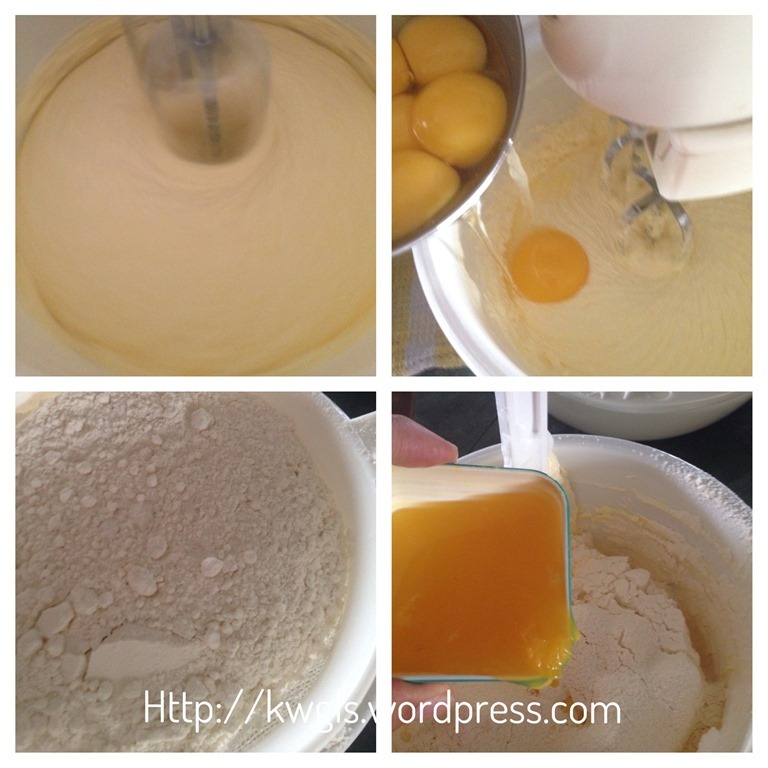 Eggs yolk should be added one by one and scrap the bottom of the bowl to ensure no unmixed egg yolk settled at the bottom of the mixing bowl. Sift 1/3 of the flour into the mixing bowl, add the orange zest, use the machine lowest speed to stir until well mixed. Add in 1/3 cream and 1/3 orange juice gradually. 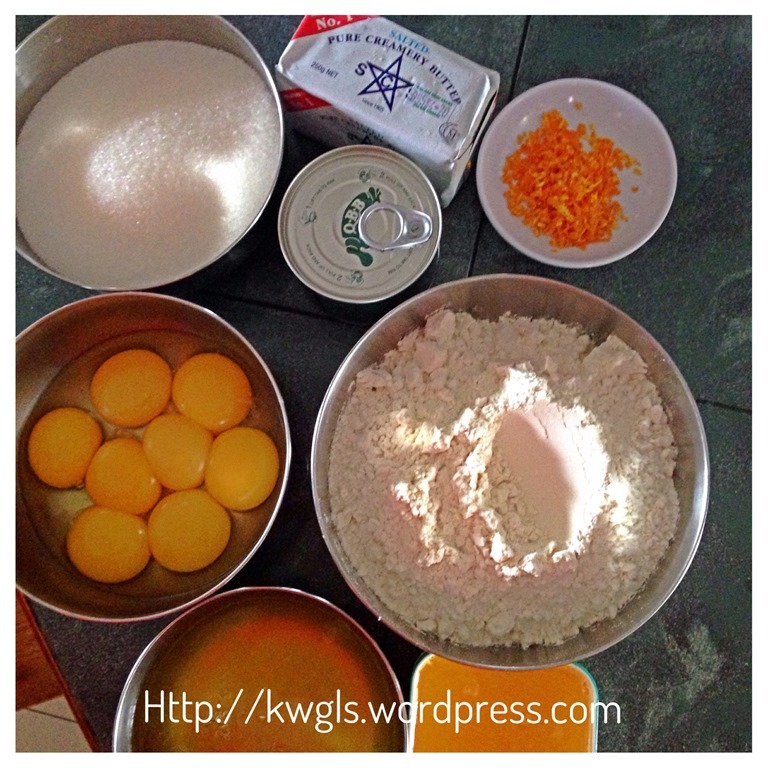 Repeat the same for the remaining 2/3 of flour, cream and orange juice until all were added. Take out the mixing bowl. Transfer the batter into the baking tin and baked at 180 degree Celsius for 45-50 minutes. After the first 30 minutes. Reduce the temperature to 165 degree Celsius and bake for another 15-20 minutes or until the top turn yellowish brown and until a skewer inserted comes out clean. If it is not cooked at the end of the suggested timing, just extend the cooking time by another 10 minutes, reduce the temperature by 10 degrees and switching off the top heat. In any case, skewer taste is still the final test. 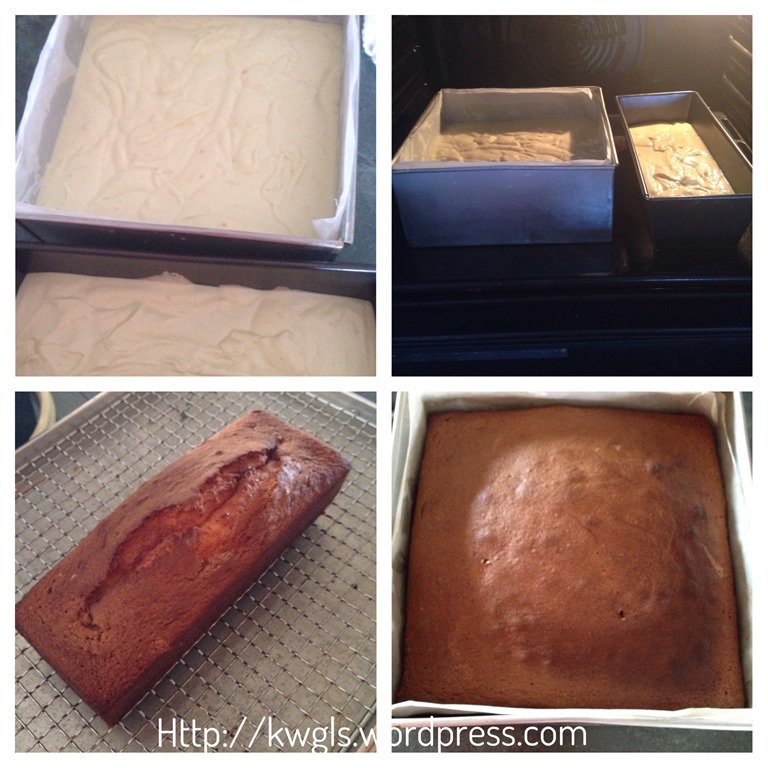 Timing is very much depends on the baking tin used and oven temperature may differs from oven to oven. 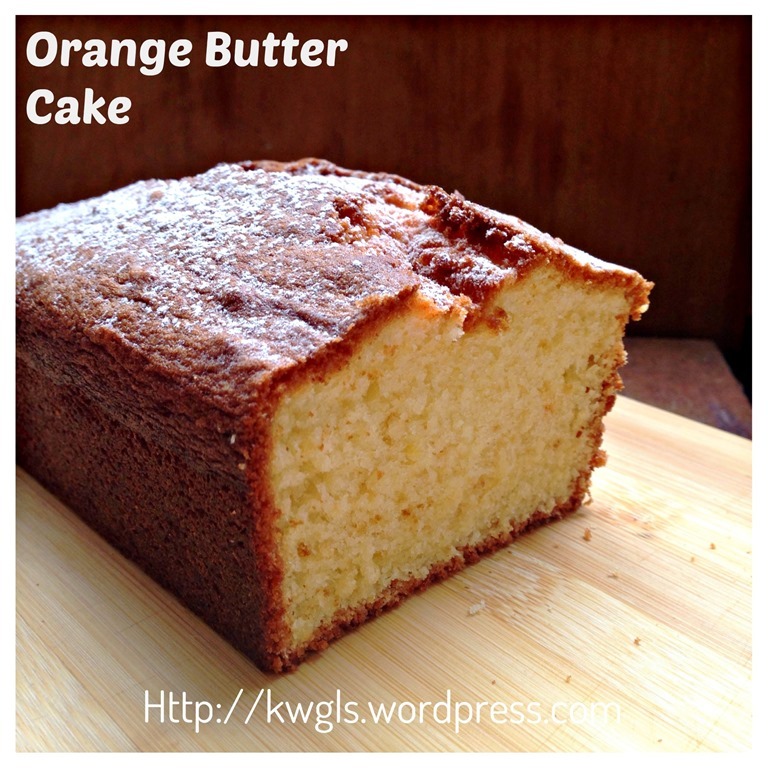 If you want some flavoured butter cake,why not try this simple orange butter cake.. 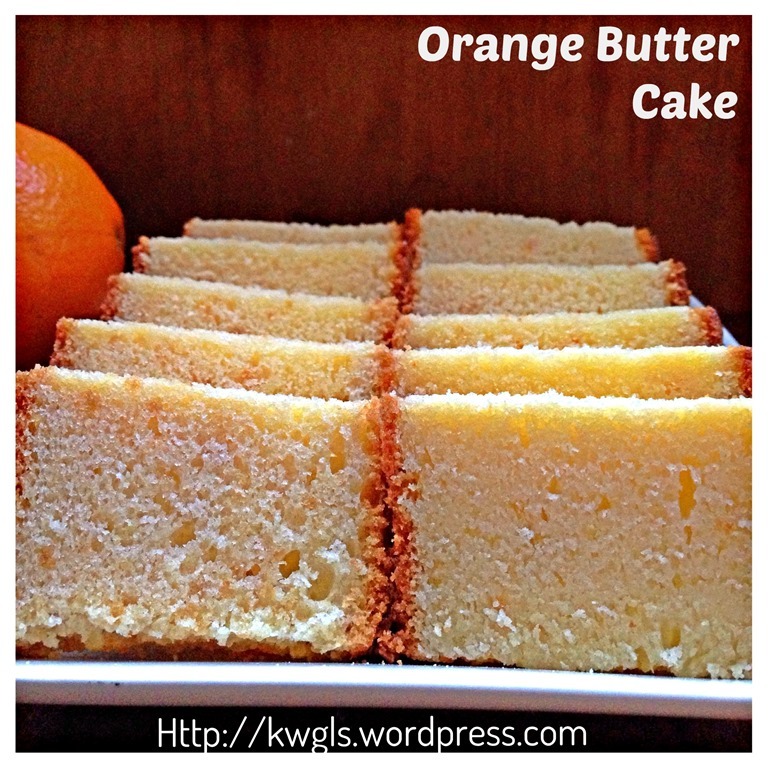 This entry was posted in Cakes and cookies, Food Preparation Series and tagged 8, GUAI SHU SHU, Guaishushu, kenneth goh, orange butter cake, orange cake, postaday. Bookmark the permalink. This looks absolutely perfect! 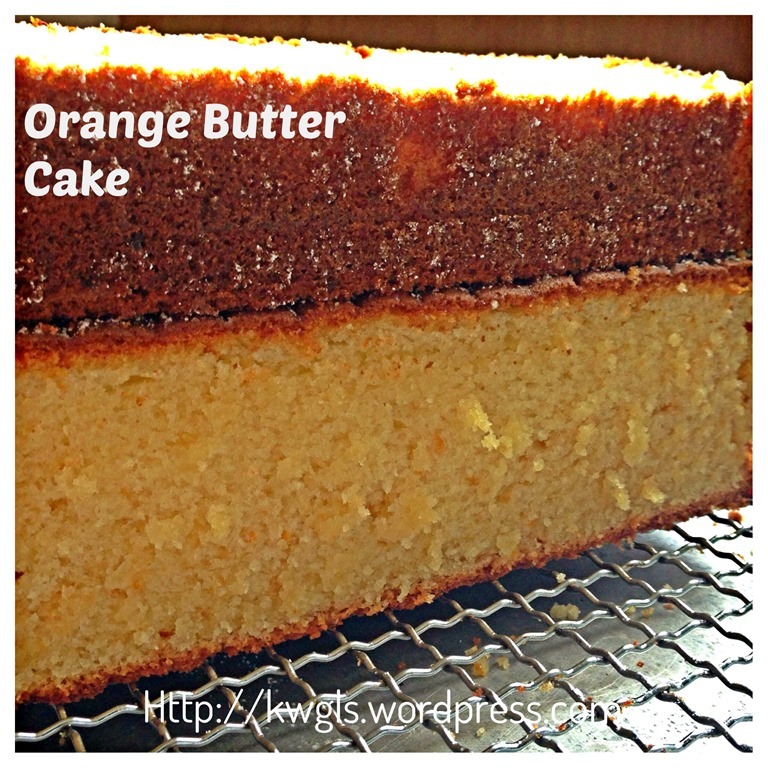 The texture looks nice and moist and dense-just how I like my cakes. Thanks for sharing!